These 4 little pirates accidentally discovered the island, while floating on the sea, looking for ships to plunder. They are convinced that there is a treasure buried on the island, so they decided to stay for a while to find it. 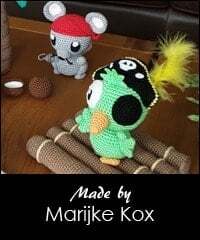 The amigurumi pirates are about 11 cm tall. These are so adorable!! I want to make all of them!!!! These are so adorable! Love them! So cute and so much detail, Captain Jack sparrow eat your heart out lol!! This set is beautiful!! I can already picture the grand kids fighting over who gets to be the octopus 🙂 Guess I have to buy some more sport yarn…. Aww. These is so cute. I love them. How adorable! Love the pirates and all the extras! Oh wauw….. I looove Them! Too bad I havent practiced enough to be friends with wire…. I would love this bunch though… Maybe I should sweettalk My mom ? 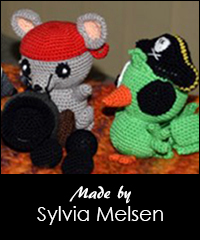 Wow, that is the most cutest, wonderful set of little pirate things I have ever seen. Can’t wait to make them. Mijn handen jeuken, kan bijna niet wachten om het te maken. Zo ongelooflijk leuk. Al je werk ziet er zo goed uit. These are so cute.. would be perfect for my nephew… he loves pirates. So cute…..and creative ….. love, love love!! !